If you’re looking for a builder to do some work in your home, we’d like to nominate someone. We think he’s the best in Den Haag. Meet Sjaak Vink. 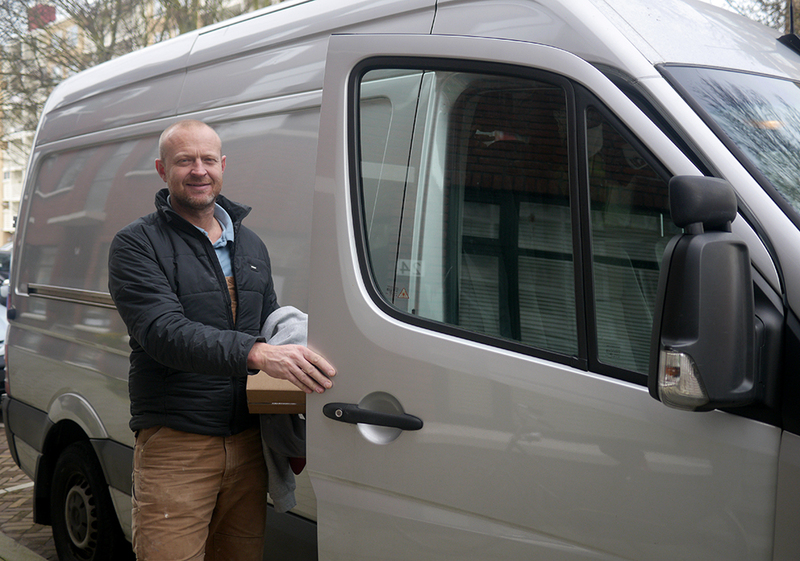 Meet Sjaak and his massive van (full of building supplies). We think he’s the best builder in Den Haag. Sjaak was recommended to us by our downstairs neighbours, who have used him for a number of renovation projects. Our neighbours are very proud of their home and aren’t the types to accept second-rate work. We figured we couldn’t go far wrong with their recommendation, but we got 3 other quotes to be on the safe side. Sjaak’s prices were in line with the others (save for one builder who for some reason thought he could do the job for €5,000 less than everyone else: scary!) so we hired him. For two weeks he worked to tear out our old kitchen and turn it into an office, and to prepare half of our living room to receive a new kitchen. 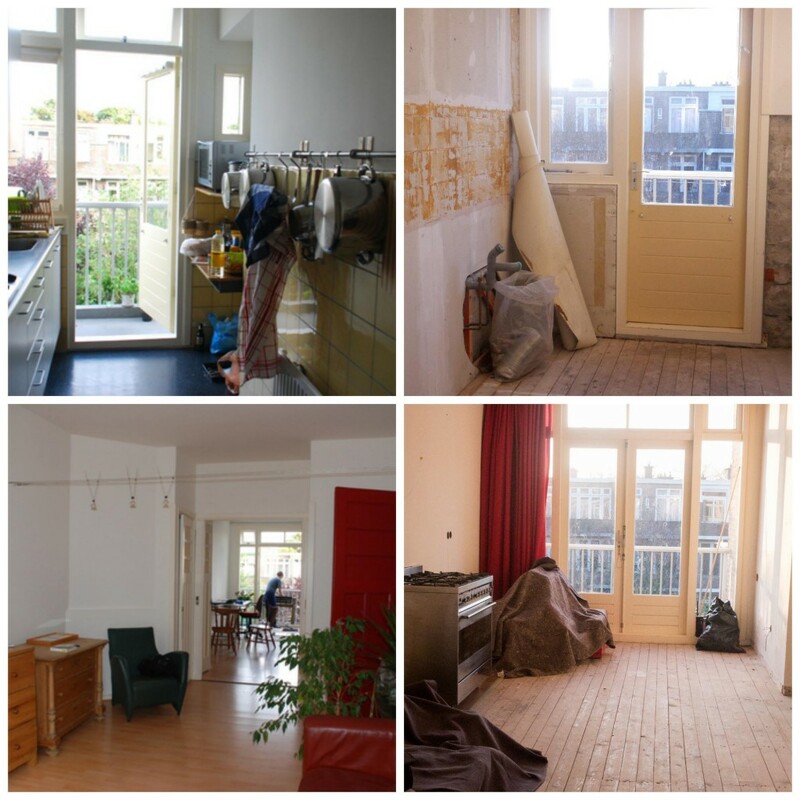 To give you an idea of the scale of the project, here’s what our living room and kitchen looked like about a week into the renovation works. On the left, you see the house as it was with the old kitchen on top and the living room below. Sjaak stripped both rooms, and prepared the old living room to receive our new kitchen. If we had to describe Sjaak in three words, here’s what we’d say: methodical, punctual and thorough. He turned up on time, consulted us frequently during the building process to make sure that we were happy with the work and his decisions, and he always cleaned up at the end of the day. What really sold us on Sjaak, however, was his pride in his work. He finished working with us the day before our kitchen was due to be delivered and installed by Bruynzeel. He expected they would do a good job, and called the next day to check with us that everything was okay. Unfortunately Bruynzeel messed up. There will be an extensive post on this later, but in a nutshell they didn’t follow their own technical drawings. They put cabinets too high, cut plinths too short and knocked chunks of plaster out of our walls. On top of this, when we called them they insisted that they’d done nothing wrong. Sjaak to the rescue! He immediately offered to call them, gave them a piece of his mind and ensured that Bruynzeel came to have a look. He attended the meeting and all of a sudden Bruynzeel agreed to fix everything. There’s just nothing like an expert on your side to make the big companies weaken a bit at the knees. We were impressed. A week later, after our wooden floors were put in, Sjaak called again to make sure everything was okay (thankfully this time it was).